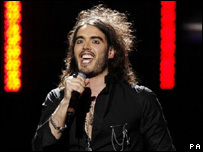 Comedian Russell Brand is leaving the E4 show Big Brother's Big Mouth after three years to pursue other projects. Announcing his decision, the flamboyant presenter, 31, thanked programme-makers for "taking the risk of employing an ex-junkie twerp" to front the show. The Big Brother spin-off is among the highest-rated programmes on digital channel E4, with up to 1.4m viewers. Brand currently presents a weekly show on BBC Radio 2, and is due to appear in the new St Trinian's film. "The three years I've spent on Big Brother's Big Mouth have been an unprecedented joy," said the presenter in a statement. "Big Mouth has afforded me opportunities that are too exciting to turn down, so alas I can do it no more. "And whilst I recognise this isn't as significant as the resignation of Beckham or the Cuban missile crisis, I just wanted to say thanks to everyone." Brand had a rocky start to his career, losing several jobs because of erratic behaviour - often caused by a dependency on drink and drugs. He got his big break on Big Brother's Big Mouth in 2004, a year after celebrity agent John Noel sent him to rehab. A spokesperson for Channel 4 said: "Russell Brand has been a fantastic front man for E4's Big Brother's Big Mouth for the past three years. We wish him all the best in his new adventures."